It’s no easy feat to shoot underwater. There is limited oxygen, for one thing. 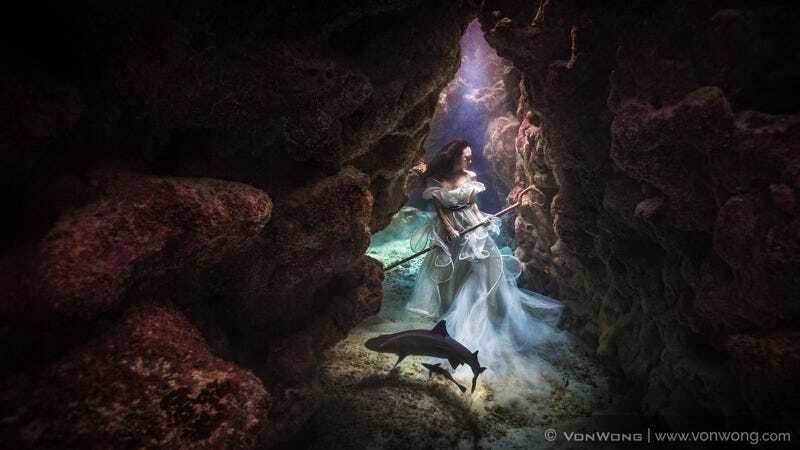 For every take, von Wong would weigh down Bourke (with oxygen mask and scuba tank) amid a pretty rock formation, in all her white-dressed glory, and wait for sharks to swim by. When that happened, Bourke would take a deep breath and remove her mask, striking a pose until her oxygen ran out. And there was just a two-hour window in which to accomplish all this: the sharks were active, and the light was right, only between 11 AM and 1 PM local time. Fortunately, Bourke is no stranger to diving and snorkeling with sharks—or at holding her breath for long periods of time underwater. A former synchronized swimmer, she took up free diving after a hip injury kept her from competing in that sport. “I’ve always been passionate about the underwater world, and I love diving with sharks and other marine creatures,” she told Gizmodo. “The sharks didn’t worry me. It was pretty obvious during the shoot that they weren’t the least bit interested in us.” In fact, they behaved more like timid squirrels, swimming off if any human got too close. Also on hand was marine biologist and shark expert Thomas Vignaud (Tourism Fiji and Barefoot Collection), who ensured that the shoot adhered to local rules governing shark dives, and kept everyone safe. “We never hand feed [the sharks], or let the food close to the surface where our guests are,” he told Gizmodo. “We don’t want the sharks to associate food with close proximity to people.” Instead, he hid a small amount of food in holes near the underwater site. “We only give a very small portion of food every day so the sharks still have to hunt,” he explained. It’s easy to be cynical about these kinds of altruistic efforts to raise awareness of ecological issues; one could argue that, in the long run, they have very little real impact. But that doesn’t mean such projects are not worth doing, or have no value—especially if the end result is eye-popping photographs like these. You can see more of these striking images below, plus some behind-the-scenes shots on von Wong’s blog. And if you’re feeling so inclined, there’s a petition available for signing, too. Images courtesy of Ben Wong/von Wong.